Lemon Cream Pie Ice Cream Bars are the perfect treat to cool down with. 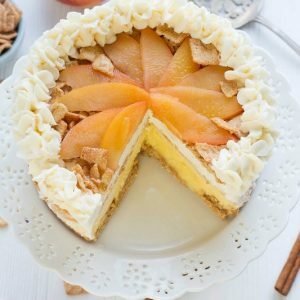 Best of all, this frozen twist on the classic pie is so easy to make with layers of vanilla & lemon sorbet with a crumbled Golden Oreo topping & no-bake cookie crust. 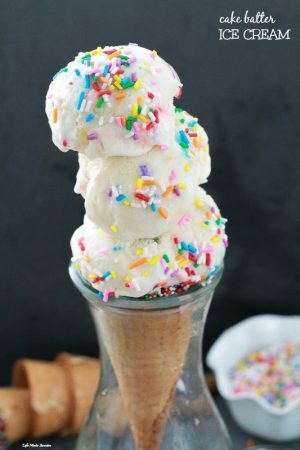 Follow my Recipes Board on Pinterest for more drool-worthy treats!My obsession with ice cream continues — it’s been so hot and humid around here plus there are just too many fun combinations. 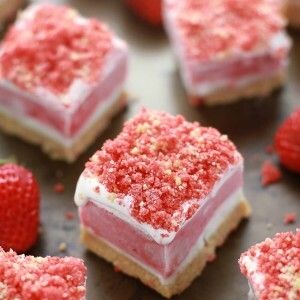 In fair honesty, I was going to post a salad today but the Strawberry Shortcake Ice Cream Bars I shared last week got such a great response with lots of readers letting me know that they made them so I couldn’t hold out on sharing the other version I made last month any longer. 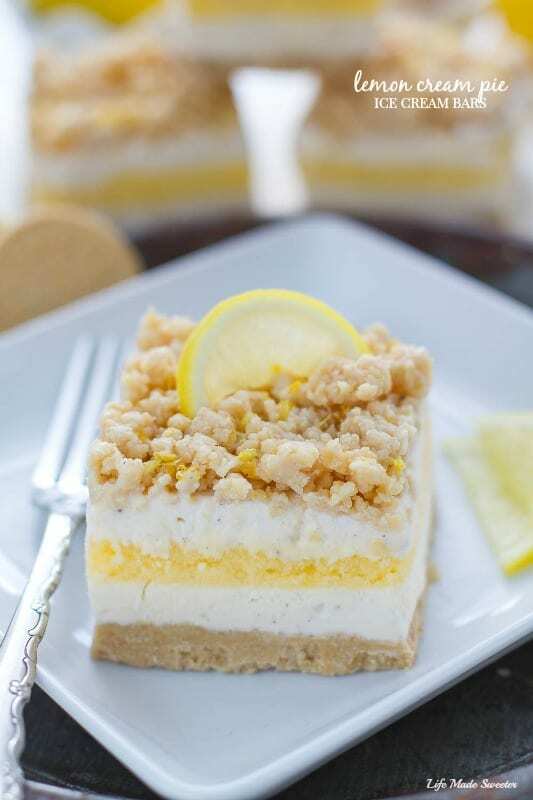 Since I am a big fan of anything with lemon, I decided to toss in all my favorite flavors of Lemon Cream Pie into ice cream bars and oh my goodness — these were AH-mazing! I’ve already made them three times since they are even more simple to make with ingredients you can easily find on hand. They start off the same way with a no-bake Oreo cookie crust that we just press into a square pan. I used Golden Oreos the first time I made them and added the juice and zest from 1 lemon. The second time I made them with Lemon Oreos and they worked just as well. You can even try this with any other lemon-cream sandwich cookie if you like. Finally, pop the pan into the freezer so they set up and then cut them into little squares. These Lemon Cream Pie Ice Cream Bars are deliciously creamy and bursting with sunny citrus flavors. 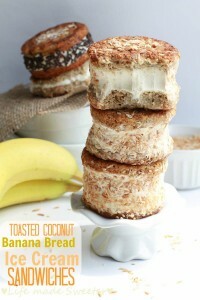 You can make them ahead of time for your next summer party or for when you have company coming over. 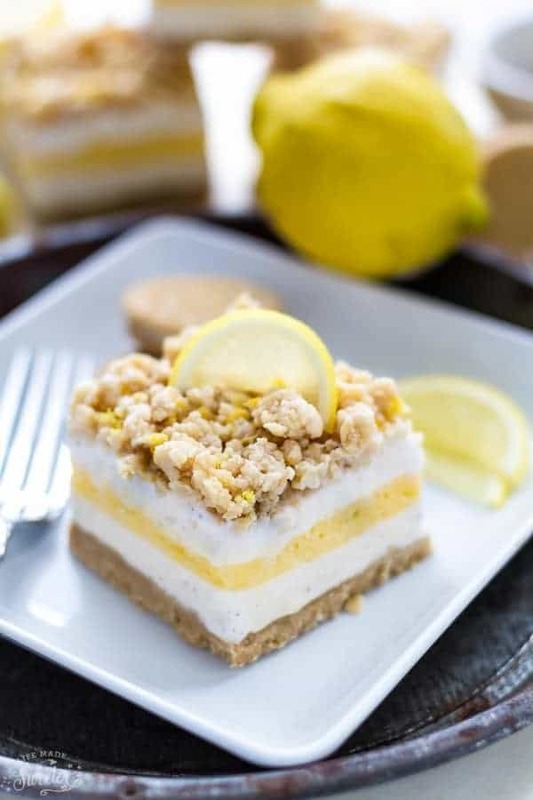 They are so refreshing and perfect for any lemon lover in your life and that lemon crumble topping will have you coming back for bite. after. bite. 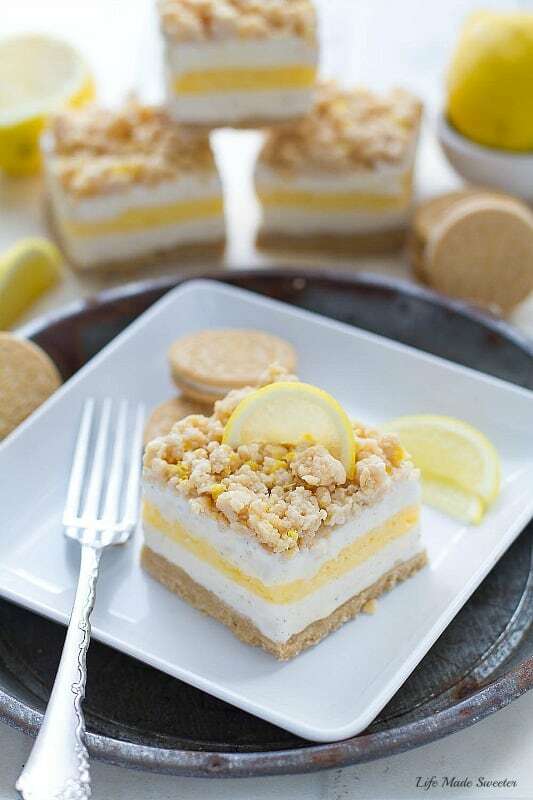 Lemon Cream Pie Ice Cream Bars are the perfect treat to cool down with. 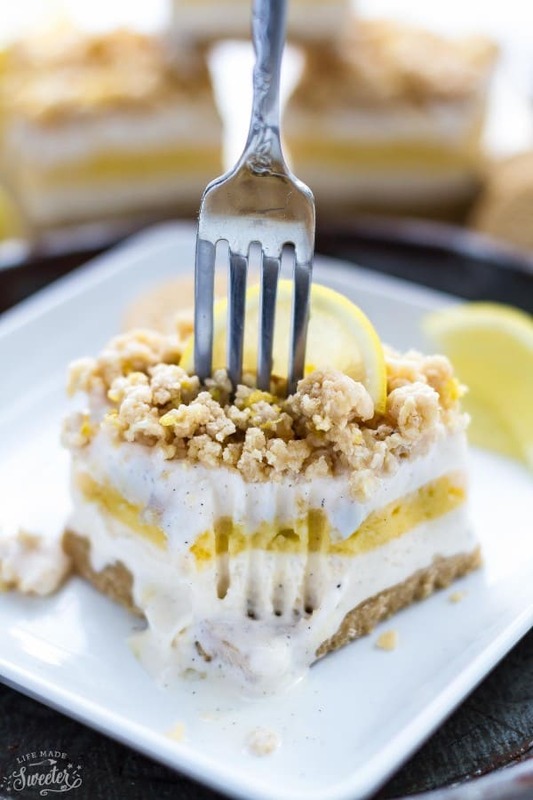 A frozen twist on the classic pie with layers of vanilla & lemon sorbet with a crumbled Golden Oreo topping & no-bake cookie crust. Line an 8 x 8 square baking dish with parchment or wax paper leaving an overhang for easier removal of the bars. Set aside. 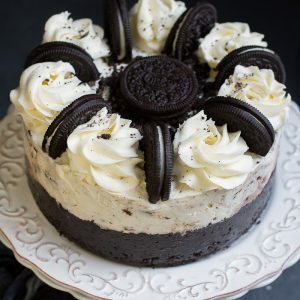 Make the cookie crust - In a medium-sized bowl or a food processor, add the whole Oreo cookies (no need to remove cream filling) and pulse into fine crumbs. Add the melted butter, lemon juice and zest and blend until well combined. Press mixture into the bottom of lined baking dish. Place in freezer to set for about 1 hour to set. Make the crumbled topping - In a small bowl or the food processor, add the Oreo cookies and pulse into large crumbs. Add the lemon juice, lemon zest, softened butter and mix gently with a fork or your hands to make pea-sized pieces stick together. Set aside in the fridge. Assemble - Remove vanilla ice cream and lemon sorbet from freezer to soften. When ready, scoop around 2 cups of vanilla ice cream over the cookie crust and spread evenly using an offset spatula. Place pan in freezer to harden slightly (about 10 - 20 minutes). Next, spread the sorbet over the vanilla ice cream layer evenly. Again, place pan in freezer for 10 minutes if needed. Add the final layer of vanilla ice cream spreading evenly. Remove the cookie crumbs from the fridge and crumble evenly over the bars. Place in the freezer for 3-4 hours or overnight. Lift out of pan using the parchment paper overhang. Allow to sit out for about 5-10 minutes so the crust softens up slightly. Using a very sharp knife, cut into square rectangles. Store bars in freezer until ready to serve. 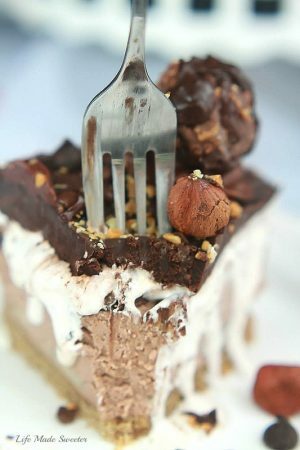 If you make this or any of my recipes, I'd love to see! Just snap a photo and hashtag it #bestrecipepicks or tag me @bestrecipepicks on Instagram! Copyright 2018 © Best Recipe Picks. All Rights Reserved.